1240 Perambulation of the Forest of Dartmoor. On the modern OS map Furnum Regis is recorded as , ‘King’s Oven (ruin)‘, the devotees of the Arthurian legends will argue that prior to the 1240 appellation of Furnum Regis the place was known as, ‘Arthur’s Oven‘. Apparently the ‘king’ to which the worn regis is applied was no other than the legendary King Arthur. Having got the fiction out of the way, what are the known facts regarding King’s Oven, as usual things are never straight forward and this place in no exception. As always, it never hurts to look at the place-name, and in this case The Place-Name Society confirm that in their opinion the name was first recorded in the perambulation of the bounds of the Forest of Dartmoor when it was listed as – Furnum Regis, in a later perambulation of 1608 the name had changed to Kinges Oven. The ‘oven’ thus referred to was an old blowing house where tin was smelted, (Gover et al., 1998, p.425). Things were not always that simple, in 1831 Mr and Mrs Bray went in search of the King’s Oven which it appears caused them much excitement. I will let Mr Bray relate his adventures but before doing so it is interesting to see how much the equipment of a Dartmoor walker has changed. His consisted of a box of sandwiches, a pocket pistol, a small bottle of brandy and a umbrella? If you are wondering, the pocket pistol was carried in case he met with any, ‘banditti‘, I like his style. ‘When I arrived there, however, I was as before, for I knew not whether I was to see a mound or a cavity, and of each of these there were many, as we were evidentially surrounded by the old workings of a tin mine… Advancing further, I observed the outline of the summit of the hill somewhat rough with stones and rushes, and, hastening towards it, found, as I conclude the object of my search. It is a circular barrow composed of small stones, seventy-six paces in circumference. Its form approaches but little to conical, being I should think, but three feet high. I saw on it no lichen or moss, which is generally found on a structures of this description that have remained in their original form, and I therefore should conclude that many of the stones have, at a comparatively late date, been carried away… Near it is a kind of trench, about six feet long, with a shorter, meeting it at right angles in the centre, the sides of which are lined with stone. And in the same direction are several pits, and one in particular of some extent in the shape of an inverted cone*. – Footnote: *It is not improbable this was really the King’s Oven, or used for the purpose of baking bread by some British chief – since it was the custom with the people of Britain as well as Gaul, to dig a deep pit, line it with stones, and make the stones hot by burning heath or wood upon them‘, (Bray, 1844, pp. 295 -299). ‘ We ascend the hill to speculate, as many before us have done, on the low cairn, the stone lined trench, and the little pits, which are all that now remain of what is generally regarded as a smelting-house of the ‘old men’. I do not, however, regard it as anything but a cairn pure and simple, and consider the trench as nothing more or less than a ruined kistvaen‘, (1895, p.173). Today the cairn is topped by a fairly modern stone heap which was the result of an earlier excavation which revealed the ‘trench’ which both Bray and Page comment on. It now measures 18m across and according to Butler apart from a slight hollow in the centre has come down through the ages unscathed, (1991, p.36). Hemery (1983, p.506) takes a different view and notes how the cairn has been reduced by the stones being robbed, he puts the circumference of the cairn to 58.5m (192ft). He also points out that the cairn later became known as Natty’s Castle because a small shelter was built on the east side of the cairn, this was probably used by a shepherd or maybe a warrener as a look-out.. 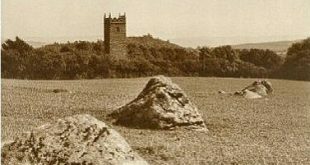 The origin of the place-name was that ‘ nat ‘ is a Dartmoor term meaning small, evidently the small shelter built beside a pile of stones made it look like a small castle. Hemery also tells us how during World War II the shelter was rebuilt and roofed in order to be used as a look-out post by the home guard. So far so good, except for one thing, according to some writers the cairn was/is not King’s Oven. William Crossing was one of the first topographical writers to correct this error and in his own inimitable style rebukes Page for his error and adds: ‘We venture to think that very few since the days of the Rev. E. A. Bray have mistaken Watern Hill for King’s Oven‘, (1990, p.247). ‘In the King’s Oven, or Furnum Regis, mentioned in the Perambulation of Dartmoor, A.D. 1240, we have the remains of the most ancient smelting place on Dartmoor. It consists of a circular enclosure of about seventy-two yards in diameter (65.83m), and but for the preservation of the name, indicating the nature of the work carried on within it, could not now be recognised as a spot where tin was once reduced from the ore found in the neighbouring streams and gullies. It was probably in use as a place for blowing, or smelting, at a period earlier than the thirteenth century… Although the Furnum Regis is ancient, we possess no evidence which would push its antiquity back far enough to come within the pre-historic range…‘. ‘In the scanty remains that now exist it would be impossible to recognise the site of the ruins of a smelting house, and it is the name alone that enables us to identify the site. Down to about the second half of the eighteenth century it would appear that most of this interesting structure, which in early times was probably the centre of the tin streaming industry in this part of the moor. was standing. Later the work of destruction was completed by the erectors of some modern mine buildings nearby, who supplied themselves with stone from the ruins. All that is now to be seen is a low rampart, composed of small stones, forming a circular enclosure rather over 700 yards (640m) in diameter, in the centre of which is a roughly rounded stone measuring 3 ft (0.91m) across and a small pile of stones that seem to have had one end worked into a round form…‘. ‘A rectangular building with a central partition and some corner-stones still in situ, it has external dimensions of forty-one by sixteen feet (12.49m x 4.87m). Whether this was the smelting house it was thought to be cannot be stated with certainty’, (1983, p.706). It would be as well to have a look at an aerial photograph of the pound and see exactly what everybody is alluding to. As can be seen from the illustration below the pound wall is visible as is the millstone that Crossing refers to. The rectangular building which Hemery describes can be seen just outside the perimeter of the pound wall and is highlighted in red. ‘Its (King’s Oven) precise position is in some doubt but the name has become associated with the prehistoric pound on the eastern slopes of Water Hill. This is an unlikely location for the boundary mark (of the perambulation) as the one following is the spring of the Walla Brook which, if the eastern branch is meant, rises only a few metres away. More probably the name originally applied to the cairn… on the summit of Water Hill, a prominent landmark on this part of the moor, and the present boundary point‘. ‘Now considered opinion leans to the conclusion that it was the cairn that was intended, and that the early perambulators of 1240 had noted the entrance passage on the eastern side of the cairn… This theory was again put forward in recent years and makes sense in that the cairn is just the sort of landmark they used‘, (2002, p.28). One last question, what was a King’s Oven? During the late 1100s the Dartmoor tin industry was prospering and ever with an eye for profit the Plantagenet kings wanted their share. To this end a new rent or tax was levied for every thousand weight of tin which was calculated on a second smelting and equated out to one silver mark per thousand weight. This second smelting took place at a house of the hiring of the king, following this the tin was weighed and stamped, all this happened in front of the King’s representatives. This, Worth (1988, p.274) considers explains what Furnum Regis was, a place appointed by the king for the second smelting, weighing and stamping of the tin. Just to emphasise the importance of this procedure, it is estimated that in 1199 King Richard recieved the sum of £600 19s 5d from the tin rents. If Worth is right, this does question the cairn theory, why would anyone want to smelt, weigh and stamp tin at a cairn unless there was a building there of some sorts? Brewer, D. 2002 Dartmoor Boundary Markers. Tiverton: Halsgrove Publishing. Burnard, R. 1986. Dartmoor Pictorial Records. Exeter: Devon Books. Bulter, J. 1991. Dartmoor Atlas of Antiquities – Vol. II. Exeter: Devon Books. Gover, J. E. B., Mawer, A. & Stenton, F. M. 1998. The Place Names of Devon. Nottingham: The English Place-Name Society. Page, J. Ll. W. 1895. An Exploration of Dartmoor and its Antiquities. London: Seeley and Co. Very interesting. Noticed the cairn on a map in the guide at the Warren House Inn and went to find it. We were curious about the name, which seemed odd since it is clearly a cairn. You can see the flat stones of the entrance way and a ditch around it, which is a feature of some cairns. The possibility that the King’s Oven was actually another nearby building – used as part of the tin process – makes more sense. It has also got me wondering about the location of nearby Grimspound. Perhaps Bronze Age folk chose the site because of the deposits of tin in the area.